If you are a journalist, blogger, or reporter and would like to reach out to Asheville on Bikes for story or comment, we welcome you to contact us via our online form. Please include your name, contact information, and time frame for response. Press inquiries should be directed to Mike Sule, Executive Director of Asheville on Bikes. In addition to using our web form, you may also email Mike directly. Asheville on Bikes is a 501(c)(3) nonprofit organization dedicated to cultivating the culture of urban and commuter cycling in Asheville and Buncombe County through advocacy & celebration. 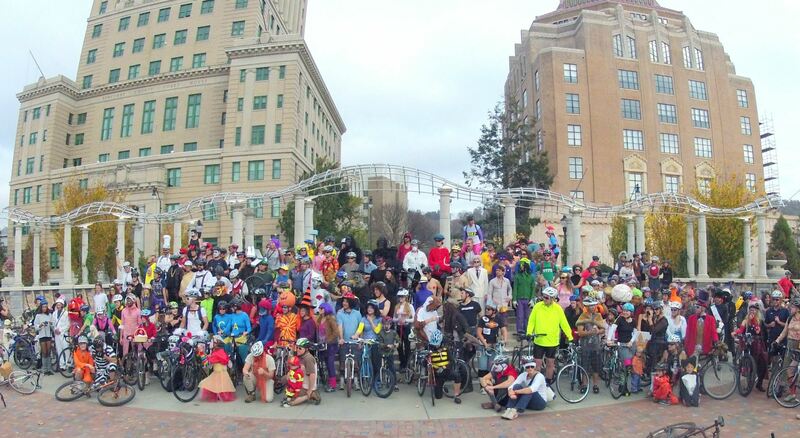 Founded in 2006, Asheville on Bikes began as a group of 25 cyclists who dressed up and rode in Asheville’s holiday parade, winning a $750 prize for their spirited presence. That prize became the nest egg for Asheville on Bikes’ initial advocacy efforts, including community rides, bike corrals, and many, many emails to city and county staff. We believe that cycling has a direct impact on the health and happiness of our community. Our membership, board members, and dozens of business sponsors work with public officials at the city, county and state levels to advocate for better roads, sidewalks, greenways and infrastructure that allow bicyclists, pedestrians, and motorists to safely exist in harmony. 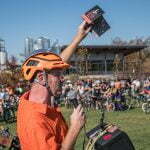 In addition to our advocacy efforts, Asheville on Bikes celebrates the joy of riding a bike through family-friendly group rides, bicycle safety and education courses, and premier annual events. In 2008, AoB successfully advocated for the City of Asheville to adopt its Comprehensive Bike Plan, a network to enhance bicycle use. In 2009, AoB played a critical role in the design of the Clingman Avenue bike lane that is used daily by hundreds of cyclists going back and forth between West Asheville and downtown. In 2015, AoB worked with New Belgium and the City of Asheville to study the impacts of a 4-foot bicycle lane and was instrumental in expanding that bike lane to 5 feet, to better accommodate cyclists. In 2016, AoB played a role in the defeat of HB44, a poorly written law that sought to limit a NC city’s ability to add bike lanes by adding an unnecessary state level approval process. In 2017, the City of Asheville Multi-Modal Transportation Committee voted unanimously to endorse NACTO bike-friendly planning standards following a presentation by Asheville on Bikes. Asheville on Bikes gets noticed! We’re proud and honored to be considered an authority on bicycle and pedestrian issues, and have been featured in various publications. Read the Streetsblog coverage of NCDOT’s failure to follow through on Vision Zero and Complete Streets in their plan for widening and speeding up a section of Merrimon Ave. Here are some handy images you can use when writing about Asheville on Bikes. 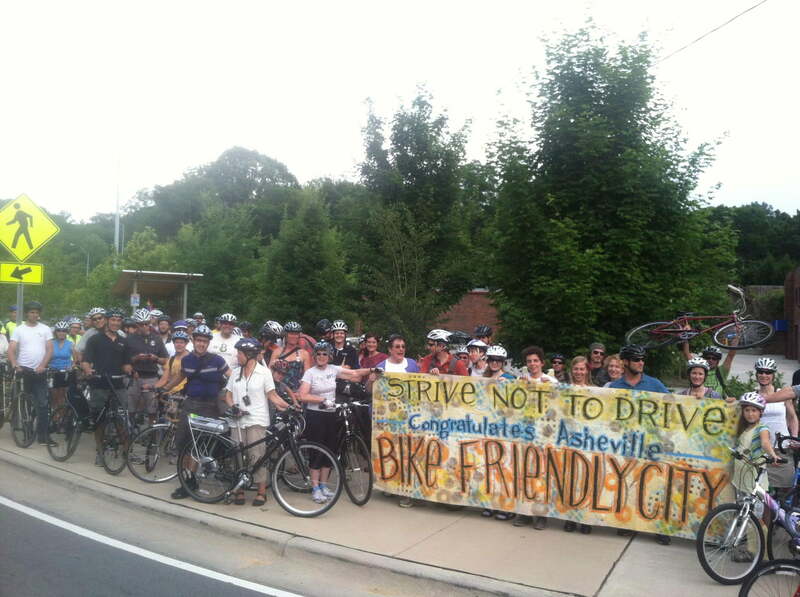 Please credit Asheville on Bikes as your source (and we always appreciate a link to our website)! Need a different image? Contact us and we’ll do our best to accommodate you. AoB Logo. Click for larger image. AoB Executive Director Mike Sule at Launch of Haywood Rd Bike Corral, April 2016. Click for larger image. AoB celebrates Strive Week 2017. Click for larger image. AoB Pumpkin Peddler ride meets in front of City Hall. Click for larger image.